(1998) "I'll Never Break Your Heart"
"Everybody (Backstreet's Back)" is a song by American boy band Backstreet Boys. It was released as the first single from their second international album Backstreet's Back in June 1997, and the third single from their debut US album in March 1998. The US debut was originally released without the song, which references the band's return via their second international album. However, once it was decided to release the single in the US, the album was re-released with "Everybody" included. Zomba chairman Clive Calder suggested the song as a single, but Jive president Barry Weiss thought it would be weird to have a song called "Backstreet's Back" on the band's first US album. The band suggested it could just mean that they were back home. After Canadian markets began playing the song, US markets near the border began picking the song up. The band met with Weiss and asked that the song be added to the US album after the first million units had already been produced. Written and produced by Max Martin and Denniz PoP, "Everybody" is one of the Backstreet Boys' most successful singles to date, reaching #4 in the US Billboard Hot 100, running 22 weeks, and #3 in the UK Singles Chart. It is certified platinum in the United States with 2.1 million sales. There are two versions of the song. The international album features the album or 7" version, which is the standard recording. The US album features the extended version of the song which includes an extended breakdown section, but cuts the bridge. The music video for the song was cut to both versions of the song, with the extended video released to the US market, and the standard video released everywhere else. In late August 2012, Backstreet Boys member Nick Carter revealed via Twitter that the group was recording the song in Spanish, and it might be featured in their eighth studio record for Latin markets. The music video was directed by Joseph Kahn and filmed in June 1997 in Los Angeles, California. A parody of the horror film genre in the same vein as Michael Jackson's "Thriller", It premiered outside the United States in July 1997, although viewers with MuchMusic USA were able to see it as at the time it was still mostly a simulcast of the Canadian channel. The concept of the video came from the band itself. The label did not get behind the concept of the band in costumes or the large budget requirements, and did not believe MTV would respect the video. The band ultimately had to put up its own money to shoot the video and had to fight with the label to get reimbursed once it was successful. The video ranked at #76 of "MuchMusic's 100 Best Videos." The Backstreet Boys also performed the song at the 1998 MTV Video Music Awards, during which they won the Moonman for Best Group Video. The video is bookended by scenes framing the context: When their bus breaks down, the band's driver (Antonio Fargas) insists that the group spend a night at a nearby haunted house (the same house used in the 1995 film Casper) while he gets help. It then shows Brian preparing to sleep in one of the bedrooms. As he is in bed, he pulls out a scary animal from under his covers, making him scream in horror. The musical portion of the video plays as a dream sequence in which each band member appears as a different movie monster: Brian as a werewolf; Howie as Dracula; Nick as a mummy; A.J. as Erik, the Phantom of the Opera; and Kevin as Two-Face-like Dr. Jekyll and Mr. Hyde. The boys, as monsters, mainly appear in their own individual vignettes related to their character, while the band as a group appears in the foyer of the house dressed in centuries-old clothing, performing a dance routine with a group of additional dancers. Supermodel Josie Maran appears as Howie's companion in his vignette. Following the song, the boys meet up in the foyer, each one having dreamed themselves as monsters. They resolve to leave, but are terrified by the sight of their driver standing at the front door with the appearance of Frankenstein's monster. The boys scream in terror, and the video ends. There are two cuts of the video; one for the US market, and one for the international market, each of which features the edit of the song released on the album for that market. The international video cuts from the opening bookend to the first verse. The bridge of the song is intact and the first half of the dance routine, a ballroom dance portion, is intercut with the vignettes under it. This leads into the second half of the dance portion during the final choruses of the song which are not intercut with the vignettes. In the US cut, the ballroom half of the dance routine and the beginning of the second half are used at the start of the song during the first rhythm-only breakdown, and is not intercut with the vignettes. The second breakdown, which replaces the bridge, is accompanied only by shots from the vignettes, along with some shots of Brian's Wolfman character doing some tumbling moves in the foyer and in the various vignettes. When the final choruses begin, the second half of the dance routine is shown again from the start, but is intercut with vignette scenes. Most of the remainder of the video is cut identically, other than several minor instances of alternate scenes or takes being used. The dance floor in the video was painted. At the end, Brian wakes up, looks in his bed to see nothing, and realizes that he had a nightmare. As he tells Howie about his dream, he and the other guys tell each other that they had a dream as well and described what they were. Howie and the others get ready to leave, but find that their bus driver is a monster, making the Backstreet Boys scream in terror. "Everybody (Backstreet's Back)" was used in the 2002 Philippine TV commercial of Rexona. "Weird Al" Yankovic put the song on the list of songs in the polka medley "Polka Power!" on his 1999 album Running with Scissors. The song appeared in one TV spot of Finding Nemo. In 2007, the song was performed by Westlife on their The Love Tour. Howard Stern had a parody on his show titled "Every Homo (Backside's Back)", which was performed by his band, The Losers. Snowball the Cockatoo, the first non-human animal conclusively demonstrated to be capable of beat induction, was first observed "dancing" to this song. Electric Six quote the familiar line "Backstreet's back, alright" in the track "Jimmy Carter" on their 2005 album Señor Smoke. In 2010, JLS performed the song along with "I Want It That Way" and two NSYNC songs in a medley on their tour for their second album Outta This World. The song was covered by Irish twins Jedward for their debut album Planet Jedward. Metalcore band Blind Witness made a cover of this song in 2009. In 2011, the song was briefly used in the horror-comedy Detention. In 2012, Old Navy used the song for a commercial. In 2012, the band licensed the song to the Kinect game Dance Central 3. In 2013, the song was performed by the Backstreet Boys at the end of the film This Is the End. In 2013, Spartan Stadium played the song during a rain delay of the Michigan State vs. Western Michigan game. In 2013, the song was covered by Darren Criss in the movie Girl Most Likely. Since June 2014, the song has been used in adverts for Go Ahead! crispy slices. Canadian hard rock band Of Tall Tales released a cover and music video for the song on February 2, 2015. In 2015, the song was used in an episode of Scream Queens. In 2015, Nick Carter and his Dancing with the Stars partner Sharna Burgess, danced a jazz routine to the song to commemorate the year Carter joined the band. ^ a b c Interview with Backstreet Boys, management, and others from Entertainment Weekly 10th Anniversary Issue. ^ "Worldwide Charts". Retrieved 10 June 2012. ^ Backstreet Boys: All Access. ^ "Australian-charts.com – Backstreet Boys – Everybody (Backstreet's Back)". ARIA Top 50 Singles. Retrieved June 2, 2017. ^ "Austriancharts.at – Backstreet Boys – Everybody (Backstreet's Back)" (in German). Ö3 Austria Top 40. Retrieved June 2, 2017. ^ "Ultratop.be – Backstreet Boys – Everybody (Backstreet's Back)" (in Dutch). Ultratop 50. Retrieved June 2, 2017. ^ "Ultratop.be – Backstreet Boys – Everybody (Backstreet's Back)" (in French). Ultratop 50. Retrieved June 2, 2017. ^ "Top RPM Singles: Issue 3321." RPM. Library and Archives Canada. Retrieved June 2, 2017. ^ a b "Billboard 16 Aug 1997". Billboard. 109 (33): 42–43. August 16, 1997. ISSN 0006-2510. Retrieved November 21, 2014. ^ "Danishcharts.com – Backstreet Boys – Everybody (Backstreet's Back)". Tracklisten. Retrieved June 2, 2017. ^ "Backstreet Boys: Everybody (Backstreet's Back)" (in Finnish). Musiikkituottajat – IFPI Finland. Retrieved June 2, 2017. ^ "Lescharts.com – Backstreet Boys – Everybody (Backstreet's Back)" (in French). Les classement single. Retrieved June 2, 2017. ^ "Musicline.de – Backstreet Boys Single-Chartverfolgung" (in German). Media Control Charts. PhonoNet GmbH. Retrieved June 2, 2017. ^ "Top 10 Hungary" (PDF). Music & Media. Retrieved May 6, 2018. ^ "Íslenski Listinn NR. 239 Vikuna 18.9. '97 - 25.9. '97" (PDF). Dagblaðið Vísir. September 19, 1997. p. 22. Retrieved April 10, 2018. ^ "Italiancharts.com – Backstreet Boys – Everybody (Backstreet's Back)". Top Digital Download. Retrieved June 2, 2017. ^ "Nederlandse Top 40 – Backstreet Boys" (in Dutch). Dutch Top 40. Retrieved June 2, 2017. ^ "Dutchcharts.nl – Backstreet Boys – Everybody (Backstreet's Back)" (in Dutch). Single Top 100. Retrieved June 14, 2018. ^ "Charts.nz – Backstreet Boys – Everybody (Backstreet's Back)". Top 40 Singles. Retrieved June 2, 2017. ^ "Norwegiancharts.com – Backstreet Boys – Everybody (Backstreet's Back)". VG-lista. Retrieved June 2, 2017. ^ a b "Romanian Top 100: Top of the Year 1997" (in Romanian). Romanian Top 100. Archived from the original on September 22, 2005. ^ "Official Scottish Singles Sales Chart Top 100". Official Charts Company. Retrieved June 10, 2018. ^ "Swedishcharts.com – Backstreet Boys – Everybody (Backstreet's Back)". Singles Top 100. Retrieved June 2, 2017. ^ "Swisscharts.com – Backstreet Boys – Everybody (Backstreet's Back)". Swiss Singles Chart. Retrieved June 2, 2017. ^ "Top Singles - Volume 66, No. 15, December 15, 1997". RPM. Retrieved 2011-01-30. ^ Billboard. 2000-01-01. Retrieved 2013-06-28 – via Google Books. ^ 1997 Italian Singles Chart. Hitparadeitalia.it. Retrieved on 2011-06-29. ^ "End of Year Charts 1997". Recorded Music NZ. Retrieved December 4, 2017. ^ "Billboard Top 100 - 1998". Archived from the original on 2009-03-09. Retrieved 2010-08-28. ^ "ARIA Charts – Accreditations – 1997 Singles". Australian Recording Industry Association. ^ "Gold-/Platin-Datenbank (Backstreet Boys; 'Everybody (Backstreet's Back)')" (in German). Bundesverband Musikindustrie. 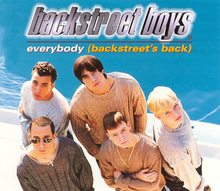 ^ "New Zealand single certifications – Backstreet Boys – Everybody (Backstreet's Back)". Recorded Music NZ. ^ Myers, Justin (July 28, 2017). "5 chart facts of the week to leave you gobsmacked (maybe)". Official Charts Company. Retrieved July 31, 2017. ^ "British single certifications – Backstreet Boys – Everybody (Backstreet's Back)". British Phonographic Industry. Select singles in the Format field. Select Platinum in the Certification field. Type Everybody (Backstreet's Back) in the "Search BPI Awards" field and then press Enter. ^ "Best-Selling Records of 1998". Billboard. BPI Communications Inc. 111 (5): 75. January 30, 1999. ISSN 0006-2510. Retrieved May 31, 2015. ^ "American single certifications – Backstreet Boys – Everybody(Backstreet%27s Back)". Recording Industry Association of America. If necessary, click Advanced, then click Format, then select Single, then click SEARCH. ^ "Promo Only: Mainstream Radio [1998-02] February 1998". Djrhythms.com. Retrieved 2012-02-15. ^ "Backstreet Boys – Everybody – Amazon.com Music". Retrieved November 9, 2015. This page was last edited on 11 March 2019, at 02:16 (UTC).